as it stunts their growth: We’ve got COMPLAIN about that! it’s stupid but then again so are many others. (even if you are leaving your house) in order to not let darkness make its home in your abode: It’s okay to practice that without creating a fictional background/history for it! So now slimy wall crawlers impart luck. I’d rather have bad luck than to let that cold blooded one sit on me. In males, if the right eye twitches its good luck and in females, if the left one does, then they’ll have a great day and loads of luck. What if, for some reason, both do? You’ll earn money by falling in a ditch? you’re going to meet someone you haven’t met in ages! : It’s a rather good superstition as it’s bringing people close unless the other person is your ex, whom you’ve been trying to avoid for long. Most popular superstition yet baseless ’cause you just can’t help if a cat crosses you. Black cats were considered allies of witches and that’s why they are so hated. I really wonder what a person’s gonna do if a black cat crosses his path on a one way. We find this in every shop, office and practically everywhere. It is believed that if a lemon turns red, evil spirits are nearby and they are overpowering and if someone steps on it, then he becomes the abode of every evil that the lemon was able to capture. Man, vegetables can be scary! It causes monetary loss and if done right after someone leaves the house, it might cause some form of harm to them. Yes, a BROOM does that to you. 10) AVOID resting under a peepal tree at night – GHOST ATTACK! Crap. Peepal trees have always been viewed as scary and have been feared because of their frightening and uncanny appearance which make them look like a ghosts’ domain.BUT it’s just that they give out loads of carbon dioxide at night which might cause some health damage to the person sleeping under it. HA! see? There’s no ghost but just a silly superstition proved wrong with the help of science! BUT it’s just that they give out loads of carbon dioxide at night which might cause some health damage to the person sleeping under it. HA! see? 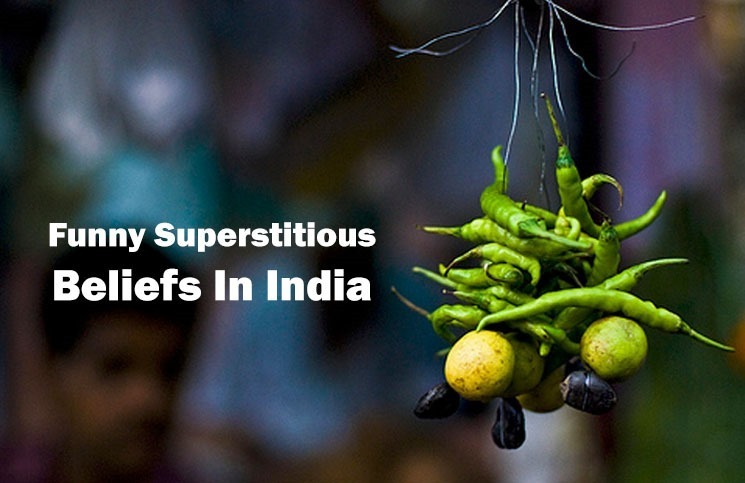 There’s no ghost but just a silly superstition proved wrong with the help of science! the house its considered to be a bad omen: The person leaving just might meet up with an accident but how is one to stop a sneeze? Isn’t it involuntary?It is just the fear, based on the baseless belief, that something bad might happen to us, which makes the negative thinking so strong that it turns into actions. Isn’t it involuntary?It is just the fear, based on the baseless belief, that something bad might happen to us, which makes the negative thinking so strong that it turns into actions. How can something abstract like a family bond be broken or cut by something as materialistic as a pair of scissors? You just cannot argue over a superstition! It just isn’t rational! So you cook something good and eat alone and the envious Gods cry and that too on your wedding day! That’s the only probably explanation to the above said nonsense. The only question here is, why just the wedding day? Menstruating women in India are considered impure and dirty. They cannot do or attend poojas or touch anything holy. They even can’t touch a pickle jar for if they do, the pickle in it will get spoilt. Funny how they are treated that way and then later wooed to reproduce, to continue a family’s line forward. They even can’t touch a pickle jar for if they do, the pickle in it will get spoilt. Funny how they are treated that way and then later wooed to reproduce, to continue a family’s line forward. for, their purpose then will not be fulfilled: So your determination, perseverance and the way you present yourself is all secondary to other person asking you “where you are going”? Funny superstitions indeed. FIRST TIME blogger and am anything BUT 'normal'... love singing ,writing and reading novels. Everyone of us have had certain experiences,I like giving voice to mine.